Laurent Koscielny has distanced himself from reports linking him with Marseille, saying he is happy at Arsenal. 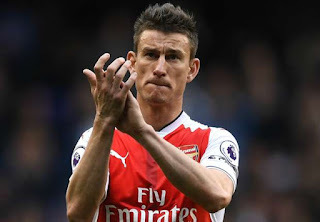 Speculation has emerged that Marseille, who finished fifth in Ligue 1 last season, are targeting Koscielny, 31, as they look to strengthen for next term. But the France international told Telefoot: “I have a contract with Arsenal, I even signed an extension last November until [June] 2020. I feel very good there. Marseille have also been linked with a move for Koscielny’s Arsenal and France teammate Olivier Giroud.